Anyone having a pet, whether cat, dog, fish, or bird, knows how expensive that small, household animals can be. Feeding pets is the main cost. Of course, livestock are much larger and the feeding costs much higher. Pastures are a wonderful resource to farmers and ranchers for feeding livestock and pastures can be even more worthwhile with proper management. The benefits of grazing on animal health are many. Having animals on pasture will improve reproduction because the livestock socialize naturally with less competition, reduce infectious diseases because the livestock are dispersed, provide exercise, and reduce foot problems because pasture is more comfortable than stalls. Much of the earth's surface contains grasses but much of that land is poorly managed. America has historically "land rich" and we have not had to carefully manage each acre to survive. Countries much smaller, such as New Zealand or Ireland, have had to learn to nurture their land resources. Farmers and ranchers in those countries are "land poor" but "knowledge rich." It would be wise for the US to learn how to best utilize our grasslands because as the population increases we will no longer be "land rich". The best step to better land management is a basic understanding of grazing. 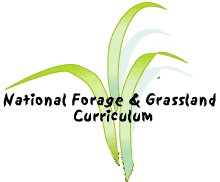 Grazing is allowing livestock to eat the growing forage; grasses, legumes, and forbs, in a pasture or range. It is harvesting by animal instead of by machines. Grazing provides wonderful nutrition and other benefits to the animal and actually produces better and more productive forage growth. A normal grazing season in much of the US runs from April to October. Therefore, grazing is the easiest way to feed livestock for most of the year. It is also the best way to have healthy plants. On the positive side, if grazing and land management are the main tools in utilizing land resources, then wonderful solutions are possible. We don't need more land or even better land as some areas of the world. We only need to learn and apply basic principles. One basic concept that would add greatly to better production is rotational grazing. Most pastures and other grasslands have been continuously grazed. Animals are permitted to wander across a pasture or range throughout the grazing season or much of the year. Continuous grazing produces the lowest pasture yields because animals will select their favorites and eat them until they are gone. Other species, less appealing, are ignored and allowed to grow past their prime. But there are other, more productive ways of grazing which will be presented in this topic module.